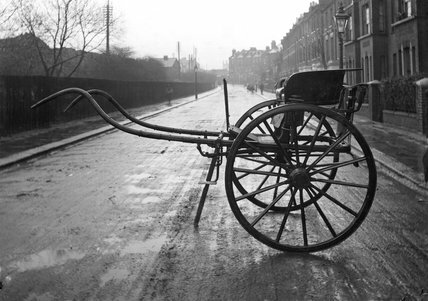 Photograph showing a side view of a Tilbury gig, a light, open, two- wheeled, one-horse carriage popular in France, England and America. Fitzroy Stanhope, a desigenr of carriages during the late 18th century and early 19th century, designed the Tilbury and the Stanhope gigs, both popular variations on the standard gig. The gig first appeared in the 17th century in France and stayed popular up to the 19th century. It is still used today in horse shows.